Interested in this opportunity? Please fill out the contact form below along with links to your website/portfolio. Thank you. Gus Boozeman lives in the slums outside New York City. By day he worked for Jimmy a known criminal, in his second hand store. By night Gus is a janitor. One of his jobs includes cleaning the executive offices for Banker’s Securities Inc. It is located on the 7th floor of the Fraser building in the heart of the banking district in New York City. It is a usual evening for Gus, he starts his cleaning round by emptying the trash that has accumulated throughout the day. Suddenly, amongst the trash he discovers the wrist and hand of a woman in the dumpster. Gus doesn’t wish to call in the police but feels it is the right thing to do. His gruesome discovery unsettles Gus – in order to avoid the police for as long as possible he continues his cleaning rounds, that is, until he arrives at the 7th floor and discovers the rest of the woman’s body lying in a pool of blood outside the CEO and Presidents office of Bankers Securities’. The girl, he remembers as executive secretary Marlene Brice. It takes no time before the police are swarming the building and Gus is heavily involved with the murder. Later that night Gus arrives home where his wheelchair ridden Pa eagerly awaits Gus’s firsthand account of the murder at the Fraser building. Gus feels uneasy and wants to forget the whole incident but for Pa who spends his days sitting and waiting, feels it is by far the most exciting thing in his life and he wants to hear every detail. CEO and President of Bankers Securities Brock Burke could not be a loving man toward his wife when he was enjoying, yet another, affair. Tonight, with his beautiful wife Siobhan Burke next to him, it was no exception. As her tears silently flowed she forced herself to find sleep and forget the hurt and loneliness in her marriage. Deep in the night, inside the darkened room Brock’s cell phone disturbed the stillness and he learns the news of Marlene Brice’s murder. Her murder immediately sent him into deep shock and foreboding. He was only with her hours before so how is this possible! She was his lover and this time he was contemplating leaving Siobhan to marry her, if Marlene had wanted him to. This time, Brock thought it was different…Brock dressed hurriedly and raced back to his offices at Bankers Securities where the police wait with many questions. Brock remained deeply in shock – how much did he need to tell them? How could this have happened? Brocks mind was in turmoil. While at home, safely tucked up in bed, Siobhan wiped away her tears, and with her long blond hair cascading over the pillow and a slight smile on her lips, she slept peacefully, alone, in her mansion. Hugo and Alberta Grasshopper outwardly have the life most of us can only dream of; they enjoyed wealth, success, a loving marriage and two beautiful grown children. Zac their son chose long ago to forgo the family business and live in England with his wife and two small children. While their daughter Neve, remains forever the adventurer and embraces her parents’ fast paced and dangerous lifestyle as international embezzlers. Alberta, is the brains and genius behind each of their assignments, she creates the disguise’s Hugo must wear; she researched the person he is to become and finds the companies that can afford him. Together, over the years, they have taken millions of dollars from many unsuspecting companies with Hugo disguised as the company’s Chief Financial Officer. With his endearing charm, sharp humor and the smarts of an accountant; he enjoys his time inside each large company before disappearing with millions of company dollars, without a trace. Often the missing money is not detected immediately, sometimes it is. But, either way, Hugo and Alberta are already living their lives in disguise in a new city, and working within another company – where their adventurers and challenges begin all over again. It is Neve who alerted them to the murder at Banker Securities the night before Hugo was to start work disguised as Alastair Rasnic. It was Neve who decided to help with their cover, and, with the help of Alberta’s genius transform herself into the stunningly beautiful Amanda Dolman, Brock Burke’s new executive secretary. But it was Hugo who was not prepared to become involved in all the happenings inside Banker Securities. Saffron Moffit, Brock’s second in command, not only runs the company, but she uses company funds to purchases drugs for her drug running business. It is Saffron Moffit who leaks vital information about the biggest merger Banker Securities had ever been part of and it was Saffron who brought the Columbian Drug Lords inside the organisation. On his very first day Hugo felt everyone’s trepidation or was it fear for the controlling diva and it wasn’t long before she turned her attention on him. With all Alberta’s high powered listening devices and up to the minute technology nothing had prepared them for the things happening inside the company. With the police asking questions about Marlene Brice’s murder and Saffron becoming more and threatening by the minute. Hugo asks himself if this is indeed their last job. But will they get caught or will they retire? The question haunts him as each day looms. Lately, he is remembering the Grasshoppers motto as it swims in his head, ‘A Grasshopper always looks after its own.’ But can he protect them all? Chuck Hollingsworth was a happy man; until the suspicious death of his father retired FBI agent Sheffield Hollingsworth. Sheffield held his cell phone in one hand and in the other he had a large dirty file folders with many pages dog eared and yellowed on the corner. He was talking to his son, Chuck and, as he walked he discussed the one case file that he’d taken with him when he retired from the force twelve years earlier. It was the one case that haunted him and the one he had nearly solved several times. But, as he spoke excitedly to his son he told him that it was now finally solved and the Grasshoppers were as good as behind bars. So excited was Sheffield that he didn’t look before he crossed the road in the small town where they lived. Usually there was very little traffic, however today a large quarry truck had somehow lost its way and was hurtling down the narrow street. The driver never stopped as he didn’t know he had just killed a man nor did he know he had saved the Grasshoppers from a life behind bars. With his father dead and the Grasshopper File scattered in the wind Chuck was no longer a happy man. He was setting up his own Private Investigation business and Sheffield was supposed to be right there beside him and now he wasn’t and never would be. The remaining Grasshopper File sat on his new desk as he stared into space. Several days later he decided he couldn’t stand the sight of it and through it into his second draw, where it sat undisturbed for a long time. When Neve Grasshopper, still in her disguise as Amanda Dolman met Chuck Hollingworth, she had no way of knowing his father had spent many years of his life tracking down her parents. All Neve and Chuck knew was that they were madly in love. So they married and lived happily. Neve found it harder and harder to stay in disguise; she wanted to tell her husband who she was. Chuck was the type of guy everyone liked and when Mr and Mrs Dolman met him they liked him also. But his occupation made them wary and for the first time Neve and her parents didn’t see things eye to eye. Finally, Alberta persuaded Neve to bug the offices of ‘Chuck Hollingsworth P.I.’ It was about that time Chuck employed a friend of his fathers and together they decided to re-open the Grasshopper File. Neve’s idyllic life would change forever as they listened to the evidence Chuck had against the Grasshoppers. They knew he was closing in, and fast. Neve had grown up alongside Zax and, like her brother they knew the Grasshopper motto well, ‘A Grasshopper always looks after its own.’ With her second child on the way and her parents’ life in peril, Neve needed to chose between her parents living in freedom or her happiness with the man she loved. 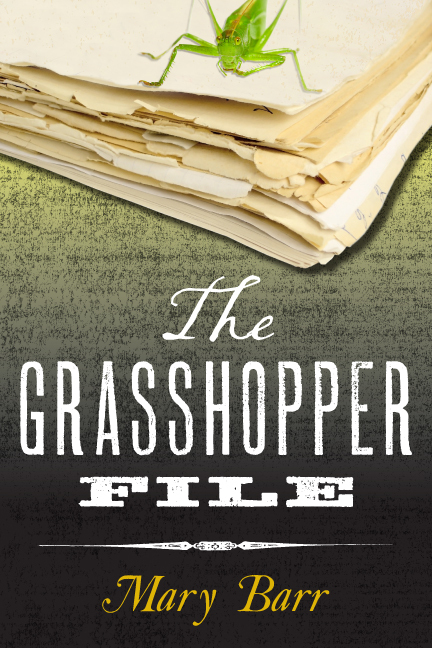 The Grasshoppers had never adhered to murder, but it was murder that brought Neve home to the safety of Grasshopper mansion in Savannah and it was Neve who brought murder with her.